The Lenoir County Community Foundation, a local affiliate of NCCF, has distributed $37,500 to date. With the addition of the second round award of $25,000, Lenoir County has received a total of $62,500 for unmet needs. 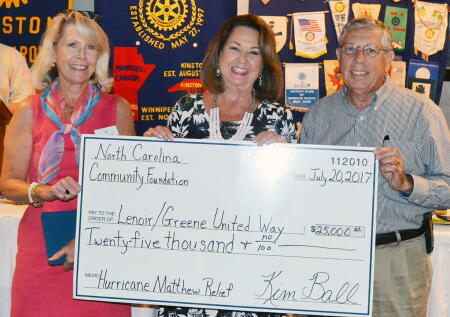 The Lenoir County Community Foundation received $25,000 from the NCCF Disaster Relief Fund, which will be directed to the Lenoir County United Way for local Hurricane Matthew disaster relief. Funding totaling $286,000 from the North Carolina Community Foundation’s Disaster Relief Fund were allocated at the beginning of the year. The LCCF also received an allocation of $37,500 to grant through the earlier allocation, bringing the total to $62,500 to date.